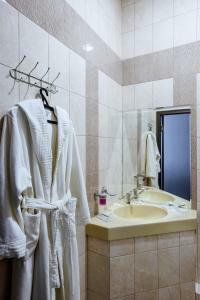 A-HOTEL.com - Luxury and cheap accommodation in Selitrennoye, Russia. Prices and hotel, apartment booking in Selitrennoye and surrounding. This indicative offer was derived from the most recently booked accommodation in Selitrennoye and sort by the price, from cheapest Selitrennoye accommodation to the most expensive hotels. To select accommodation by your preferences we recommend to choose from 1 accommodation offers in Selitrennoye in total. By entering the dates of your overnight stay in Selitrennoye and using the filter tools you can sort the best possible accommodation for you. The entered dates of your stay are crucial for the most accurate offer as it derives all the online information on pricing and availability of Selitrennoye accommodation. Then you can book the selected Selitrennoye lodging (hotels, apartments etc.) immediately. Set in Selitrennoye in the Astrakhan region, Причал Рыбака provides accommodation with free WiFi. There is also a kitchenette in some of the units equipped with a microwave and a fridge. Offering barbecue facilities, Rybolovny Klub Mesto Vstrechi provides accommodation in Zavolzhskoye. Complimentary WiFi is provided. Situated in Rybnyy Khutorok, Baza otdykha Gremuchiy provides accommodation with access to a garden. The country house offers a barbecue. Located in Rechnoy, Baza otdikha Avalon provides accommodation with free WiFi and a terrace. A fridge and kettle are also available. Rybatskaya Derevnya offers accommodation in Astrakhan. Guests can enjoy the on-site bar. Providing free WiFi, Mini hotel Vetlyanka is located in Vetlyanka. Guests can make use of a garden. Situated in Rastopulovka, Baza Otdykha Rosinka features accommodation with free WiFi and a private beach area. Some units include a terrace and/or balcony. Located in Astrakhan, Mini hotel InterCity has a fitness centre and a bar. Featuring a 24-hour front desk, this property also welcomes guests with a restaurant and a children's playground. Гостевой дом "На Солянке" features air-conditioned accommodation in Astrakhan. Free WiFi is included. Offering free WiFi, Hotel Astrafood is situated in Astrakhan. The property provides a 24-hour front desk. Boasting air-conditioned accommodation with a private pool, Kottedzh on Dubrovskaya is located in Astrakhan. Featuring pool and river views, this holiday home also includes free WiFi. Mini-Hotel Korona offers accommodation in Astrakhan. Each room at this inn is air conditioned and is equipped with a flat-screen TV. Apartment on Latysheva 3 is located in Astrakhan. This apartment features air-conditioned accommodation with free WiFi. Located in Astrakhan, Апартаменты Латышева 3К offers air-conditioned accommodation with a balcony and free WiFi. Guests staying at this apartment have access to a fully equipped kitchen. Surprise Chernigovskaya is situated in Astrakhan and features a bar. Free WiFi is offered. Located in Astrakhan, Tsveti Apartments provides accommodation with free WiFi and a kitchen. The accommodation has a spa bath and a hot tub. Situated in Astrakhan, Апартаменты Савушкина 4/1 10 этаж features accommodation with a balcony and free WiFi. Guests staying at this apartment have access to a fully equipped kitchen. Савушкина 4 к1 is situated in Astrakhan. Featuring city views, this apartment also features free WiFi. Located in Astrakhan in the Astrakhan region, Апартаменты Савушкина 6ж has a balcony. Guests staying at this apartment have access to a fully equipped kitchen. Set in Astrakhan, Комсомольская Набережная 12 кв 13 provides accommodation with a balcony and free WiFi. Guests staying at this apartment have access to a fully equipped kitchen.